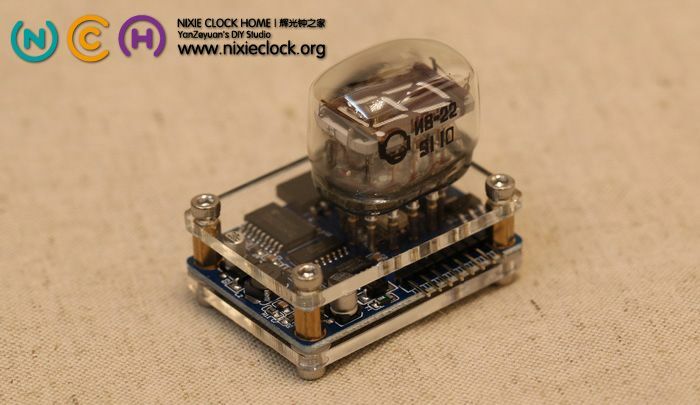 Just as the Nixie Tube, VFD tube is also on the verge of extinction. It has been fade out from modern applications since the 1990’s. Young generations may have never seen its limpid cyan fluorescence, given life by the intelligence of the last century. 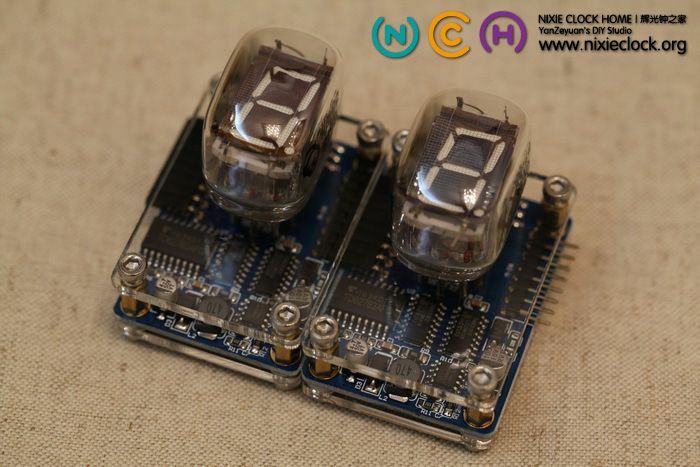 With the same concept of developing the Nixie Tube module for Arduino, in order to make the VFD tube reborn, combined antiquated electronics with modern technology, the VFD tube module is developed as independent blocks. 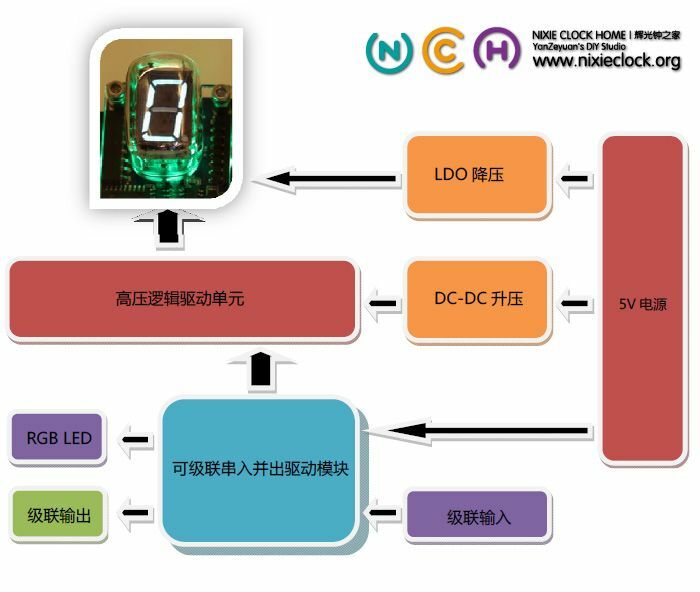 Without headaches about high-voltage generation, logical driver, soldering, geekers can focus their time and energy on achieving the design idea of the final works. 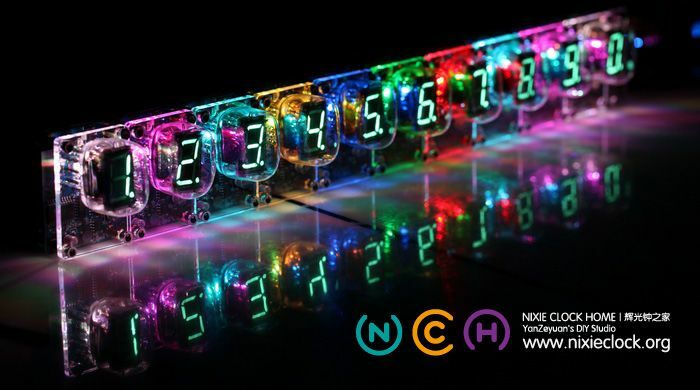 Meanwhile, for designers with no electronic background, Arduino is all they need, of which 4 I/O pins can supply full control on a dozens of VFD tube modules with individual RGB led background lights. Other MCU systems or developer kits would do the same. 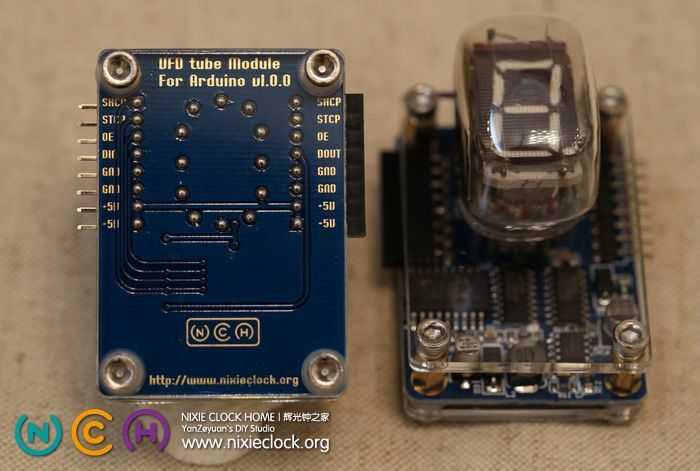 Thanks aGuegu for testing my VFD tube moudle first-handed and developmet of its Arduino library. The technology of VFD is still widely used nowadays, however, no more in tubes. VFD screen is Hi-fi equiment, Automobile instrument panels. This device consists of a hot cathode (filaments), anodes (phosphor) and grids encased in a glass envelope under a high vacuum condition. The cathode is made up of fine tungsten wires, coated by alkaline earth metal oxides, which emit electrons when heated by an electric current. 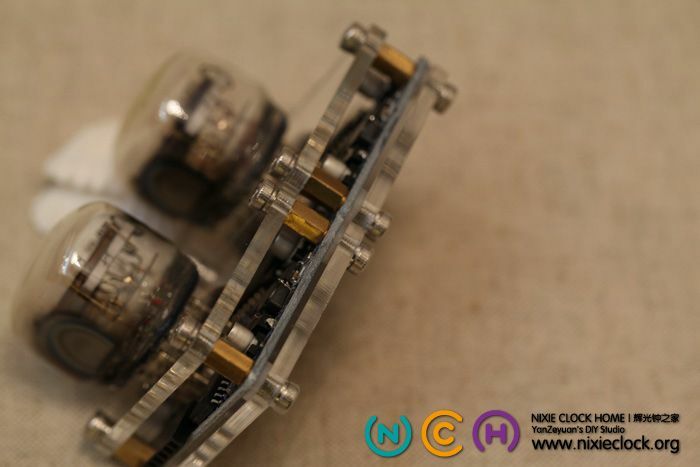 These electrons are controlled and diffused by the grids, which are made up of thin metal. If electrons impinge on the phosphor-coated plates, they fluoresce, emitting light. 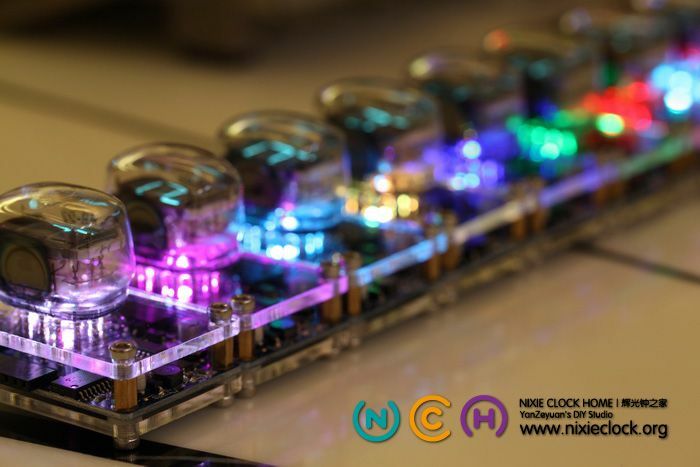 Constract to the Nixie tube, it requires lower supply voltage, which means is safer and longer life expectancy. This module application use model IV-22 (ИВ-22) VFD tube, dimensioned as a rectangle of 32mm * 22mm. 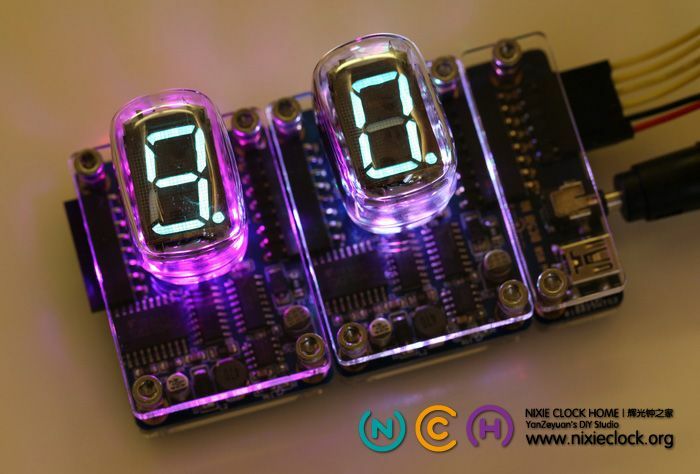 It display on top with 12 pins. These batch of tube were mass manufactured in former Soviet Union during the Cold War, whereas, they are stored in warehouse corners and being forgotten. But its material guarantees its unlimited shelf life. 1. 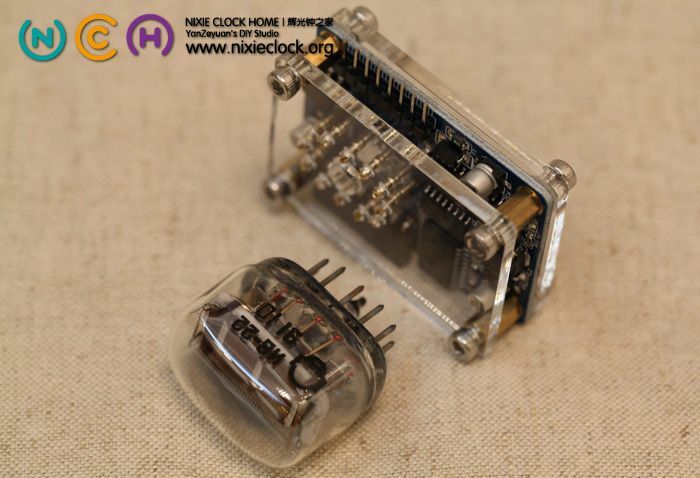 High vacuum inside, unlike the inertia in nixie tube. 2. Lower vlotage requirement and energy consumption. The filament voltage is between 1.0 and 1.3 volt, working both on DC and AC. The voltage of anodes (phosphor) against grids is 22-30v. The current in filament is 100mA, while 4-10mA in grids. 3. 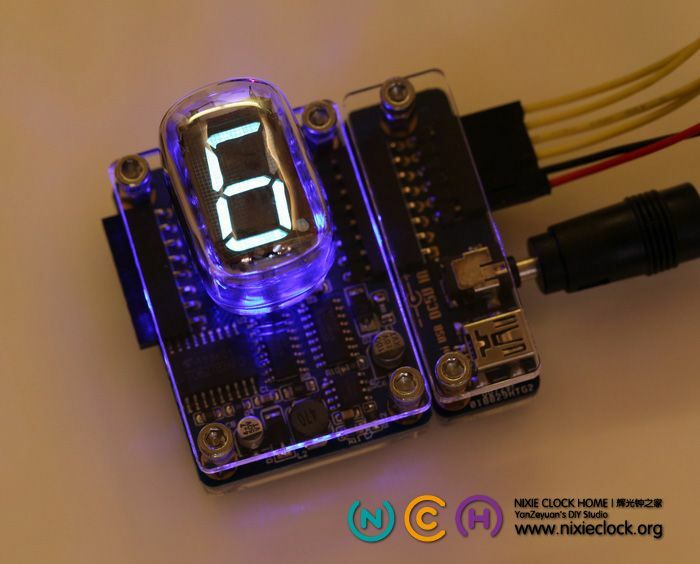 Seven-segment digital display, can present decimal figures and basic letters. 4. Cyan colored, bright light with high contrast, visible even in daylight, and not Glare. Check some photos, and more description comes afterwards. 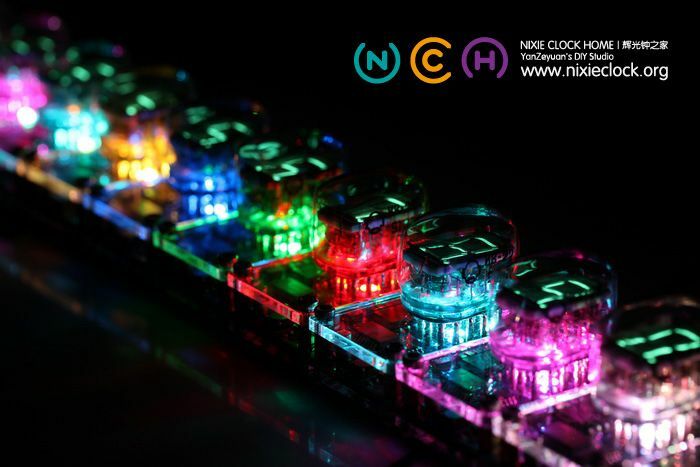 As my QS30-1 Nixie tube module. Every section of IV-22 can work individually, and can be plugged in serial with its input and output interface on both sides. Only 4 I/O pins are needed to full control the figures and background led. length: 50mm, width: 36mm, base height: 16mm, whole height: 45mm. All these specifications and conception got only one purpose, to help every VFD tube fan to focus his work and ideas, free of worries about the complex power supply and logical control. 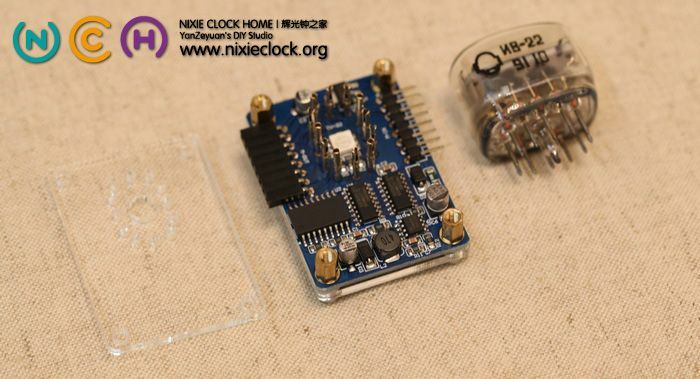 And with the experience of designing the QS30-1 Nixie Tube module and IV-22’s character, one PCB of 50mm x 36mm can do all the jobs. 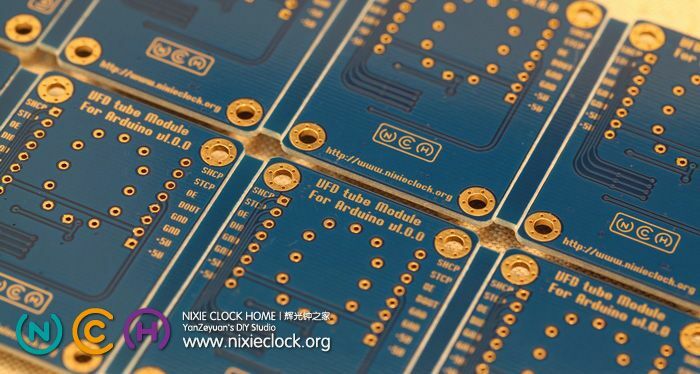 Every component on board is well chosen, no only on the specifications, but also on the packages, makes full use of the limited space on PCB. Functionality is taken cared of as well as the beautiful layout. 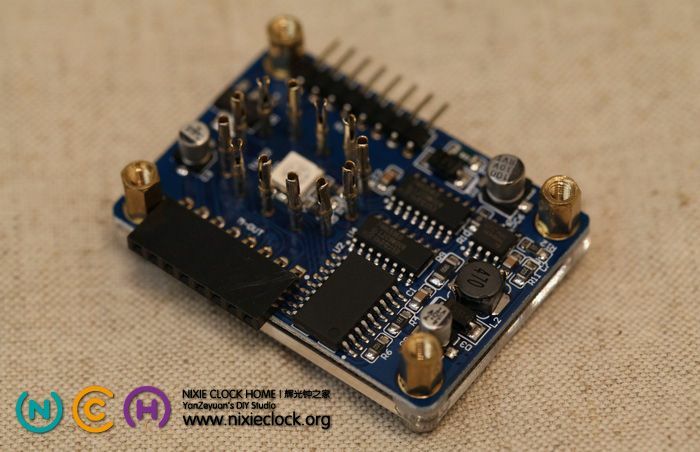 On the hardware design view, this module includes modules as below. It has been tested that VFD tube works best when the voltage of anodes against grids is 26v. To gain 26v from 5v power supply, a 5v to 26v voltage pump is needed. I adapted the classic MC34063A and its accessories. No extra MOS tube is needed. And the module would not heat when working. The filament voltage is set to 1.2v. LDO linear voltage stablizer ASM1117-1.2 is applied. In order to get serial extendibility, two chips of 74HC595 is assembled on each module. Pins and sockets on both sides supply convienience for stacking. 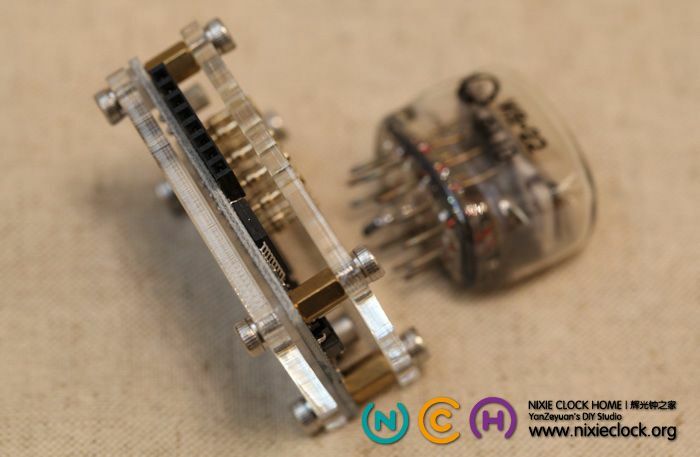 As the base of the VFD tube, a 5050 packaged RGB Led is installed to emit background lights, which is also connected to 74HC595. Each module got its own power supply and logical driver, would not interrupts each other. However, they share the same power source. In order to prevent the power supply failure on one section to interrupt others, there is a power protection circuit on each module. Once there is Over flow, power reverse happened. The protection circuit would prevent the damage to other components or modules. All assembled on a 50mm x 36mm two-side PCB. 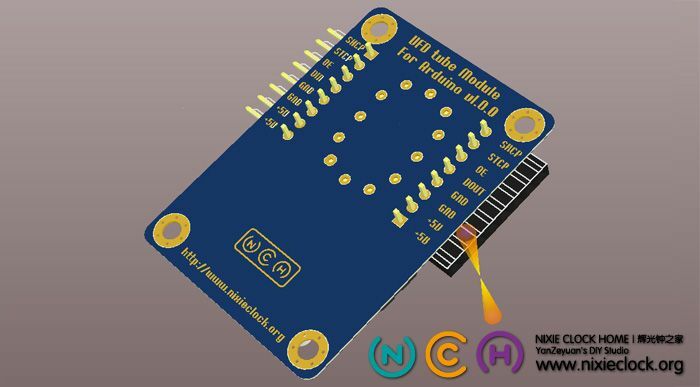 PCB designed as my former works, sea-blue base plate, Immersion Gold plated, manual layout design. For the fixture of IV-22 VFD tube, there is no suitable specialized basement available. So I use gold plated pin basement tube to connect VFD tubes, surrounding the 5050 RGB led in the center. The is no component on the back side of PCB. Every soldering spot is welded twice to make the spot round and full connected. And there is mark on pin description on both interfaces. 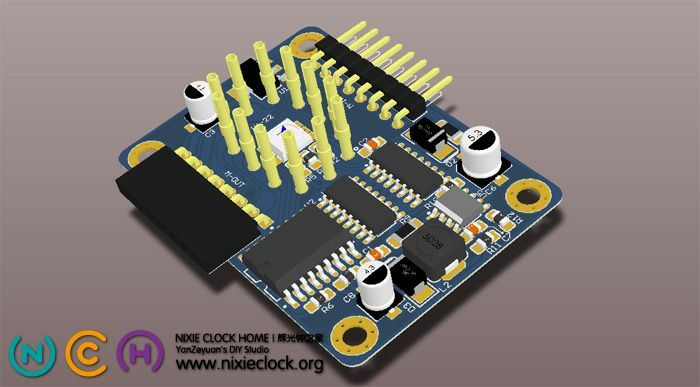 There is two sets of 5V and GND on pins. One set can be used for power supply. 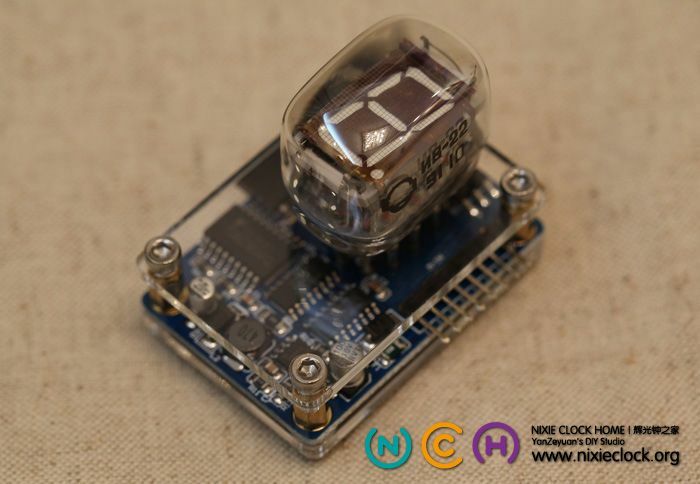 The other can be used as power source for Arduino or the controller board. The height of all components are less than 9mm. So the brass column is 9mm long to support the top layer. Since there is only one PCB board, we can see all the components from the top view. However, there is a top acrylic cover to offer protection. 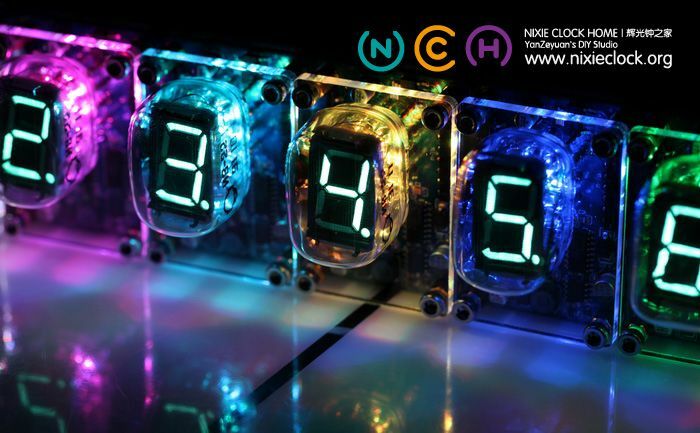 The imported acrylic cover with laser cut, matches VFD tube quite well no matter on effects or precisions. M3 stainless steel hex screws are applied to fasten the module, with 1mm nylon spacer to separate PCB from the cover. On the left side of tube, you may notice that there is a few dark stuff, which is the getter in the tube. As long as the tube remain vacuum, the getter would be dark as you see right now. Once it leaks or cracked, the getter would turn to white color, which means it is no longer vacuum inside, nor usable. It is a direct way to evaluate whether VFD tube is workable. Pulg in serial is quite simple. Just stake the modules side by side. The pins and sockets connect all the control line and power. Pins for inputs, Sockets for outputs, all spaced of 2.54mm (100mil). 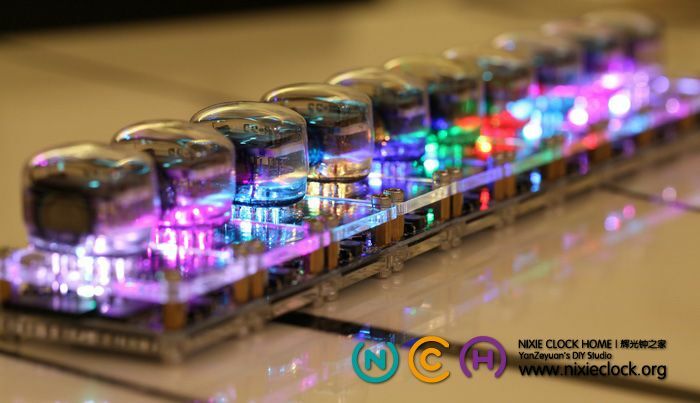 The power the module needs is DC 5V. To measure the current consumption of each module. 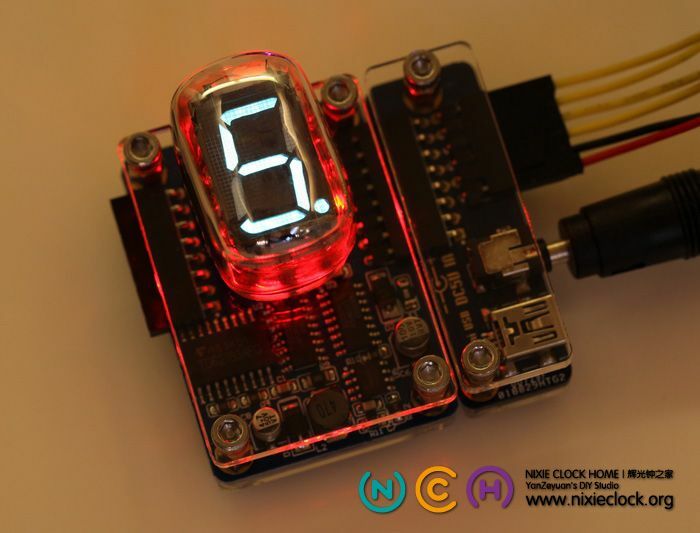 I use a minimum system of C8051F340 to be the controller, with both on on figure display and background led. As the test shows, single section consumes 280mA, while 10 sections consume 2450mA. set VFD module consumption to x, and set controller consumption to y. We can be two equations. 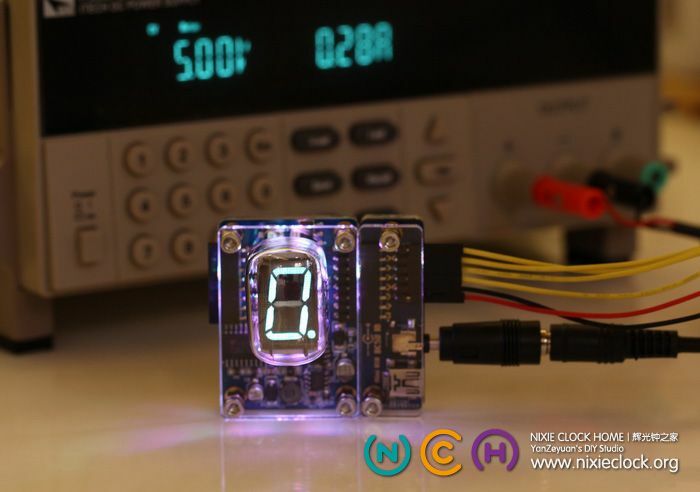 With a dozen VFD tube module in serial, we can determine figure and background led color on each module. The background led color could be: off, white, red, green, blue, cyan, yellow, magenta. 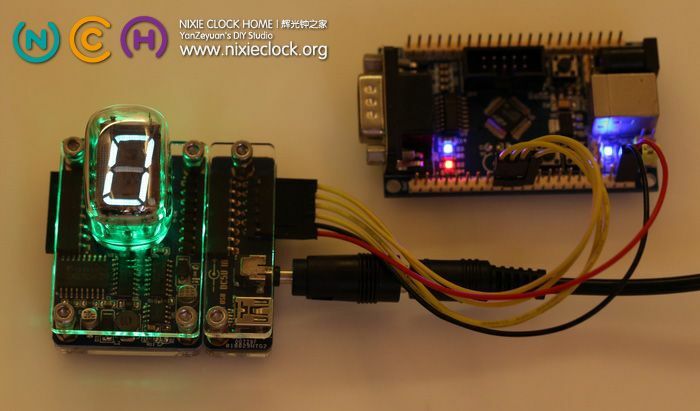 What is more, connecting OE to a controller pin with PWM capability, the brightness of module can be adjustable. 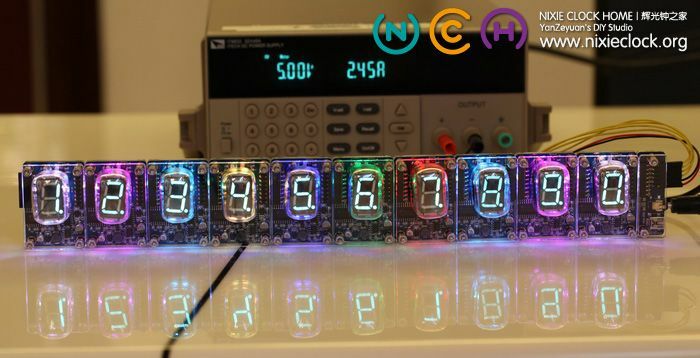 With all functions above, we can implement almost all applications with figure display: colorm, calculator, counter, temperature indicator, and so on. If you may interests, you may try the fade in/out effects on my IV-11 crystal castle VFD tube clock. I have designed an extra converter to VFD tube module to offer more power inputs. As the pictures show, the control takes 4 pins. The red/black wires connect connect the module power to the controller board. I am fascinated by the effects of the IV-22 tube display at night. The led maps not only on tubes but also the cover. Different colors bring variety of atmosphere. As the manufacture date on the tube says. The tube we use is made on 1991, when the Soviet Union disintegrated. Maybe the VFD manufacturer could not foresee their tubes can present such amazing application. Let us bring them back from the cold military warehouse and give them new lives. The most pleasure thing is that, with these module, the barrier of making VFD tube application is lower than ever. Wish the history of this ancient component will last long. Ihe radiance and its beauty, is undeniably unique. Wow, they look really beautiful. I have one question. Where do I get the extra power board / controller board. I can’t find it anywhere. 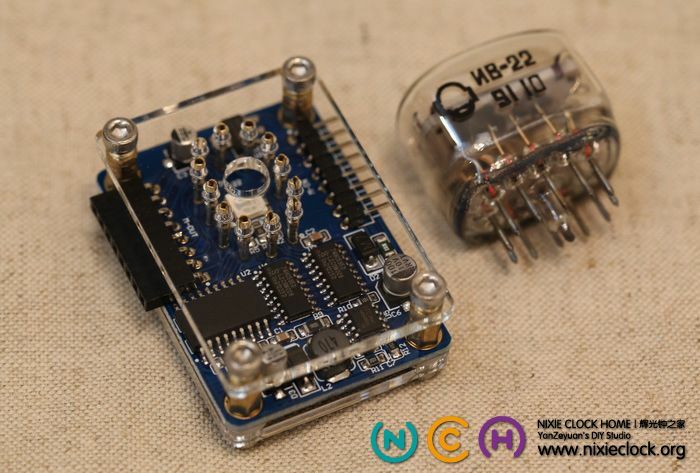 In the second picture there is this extra board with a power supply connected to the tube. I have an outlet to USB charger with 5V / 1.2A. Will this kill the boards? And can you power the boards via microUSB or is this another plug? Hello! Thanks you for providing such a beautiful website, gorgeous products and wonderful ideas! I’m astounded by the beauty, colors and technology! Just Gorgeous! 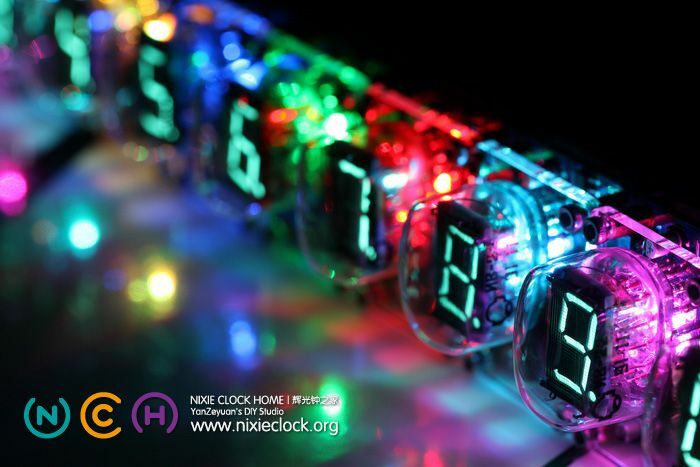 I felt like I was home when I finally found nixieclock.org! 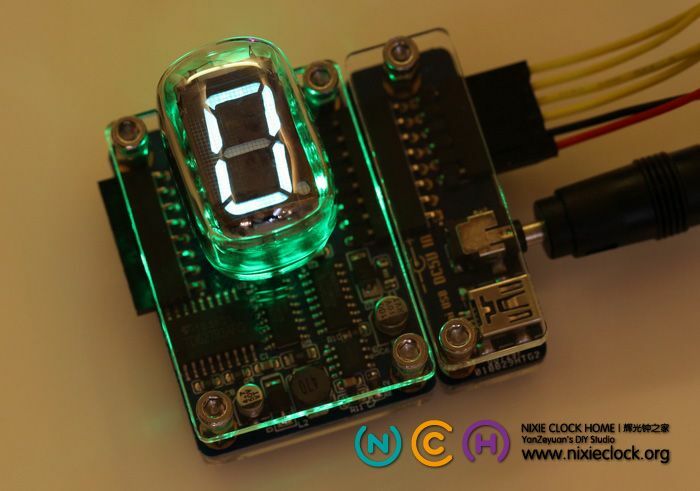 This is the kinds of items I’ve been dreaming about making for Arduino Nixie Clocks! The Big problem is, I’m also having a terrible time finding ANY of these or the power board or any other parts featured on this site. When found, they are ridiculously priced and/or out of stock! The only parts I have found occasionally are on Amazon.com or eBay from VERY questionable suppliers and generally they only have one or two in stock. I need 6 IV-22 VFD Module for Arduino today and as many more as I could hope for in a few weeks, all for private use. 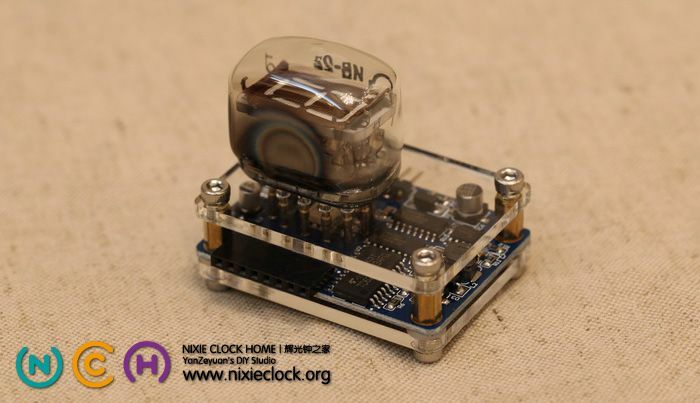 I’m learning to build Nixie Clocks with Arduino, hopefully before I lose the use of my hands in a few more years as this nerve disease progresses. Any help you may provide would be greatly appreciated! Someone who won’t price gouge these items would be a big plus! All the ones I have found on eBay or Amazon I feel, have been VERY over priced. 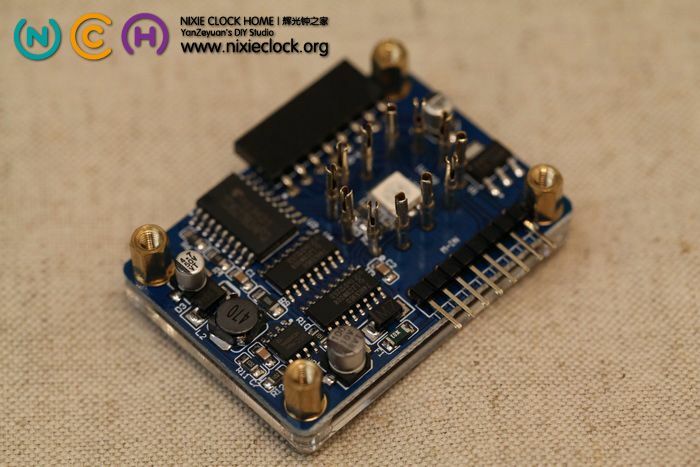 It makes it impossible to build a single clock, just for fun, as is the intention of this site from what I understand! Very COOL! Would you be able to provide a link to someone in United States, California or Arizona? I’d be most appreciative! I’m grateful for ANY information! Thank you and God Bless! Dear sir, thank you for contact. 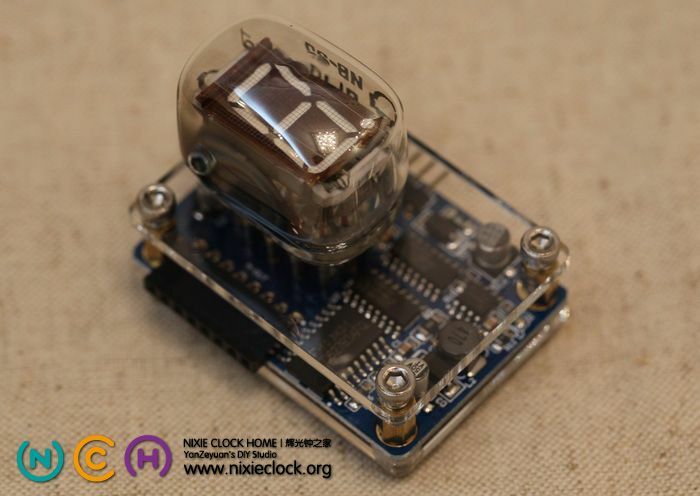 If you need any help please let me know, all Arduino lib are open source and you can use it for your own clock project. It’s awesome to go to see this website and reading the views of all colleagues about this post, while I am also keen of getting knowledge. 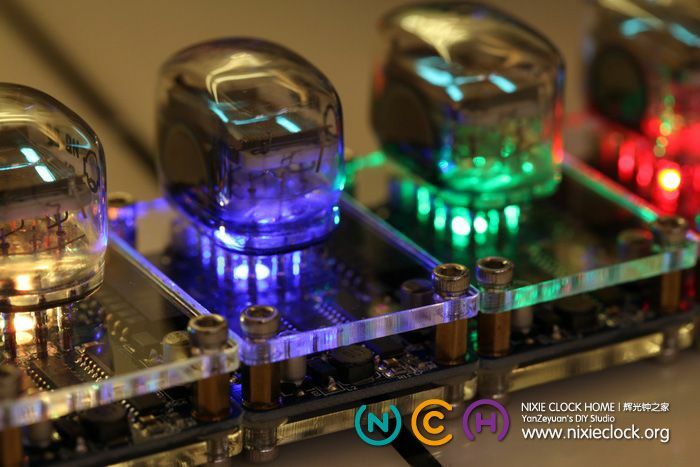 Technically, these are NOT nixie tubes, they are VFD. 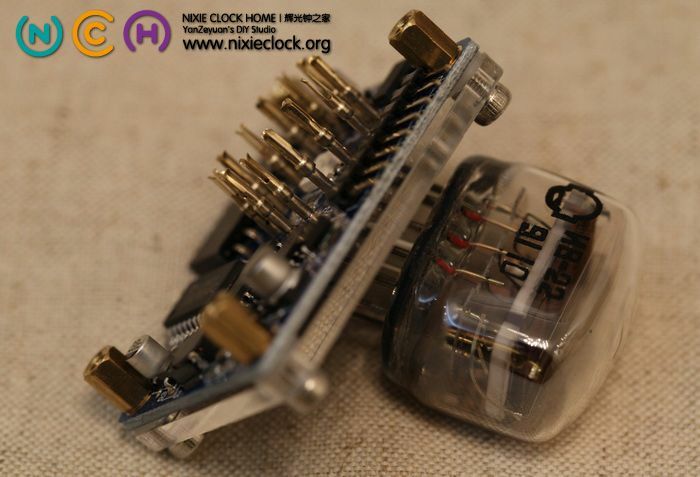 Nixies are an older, higher-voltage technology. Very nice design, thanks for sharing!